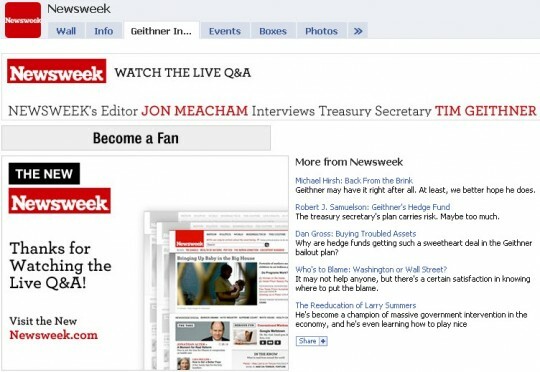 Today Newsweek offered live streaming of Jon Meacham’s interview with Treasury Security Tim Geithner on its Facebook page. This is a good example of how publishers are attempting to add more value to their official pages on social media sites which is certainly needed as many of the pages are still fairly one-dimensional. Hosting the video on Newsweek.com is a good idea because long-term that’s where you want users and search engines to access it. But it’s also really important to direct Facebook users who may come looking for it to the right place. I’d imagine the “Geithner Interview” tab won’t stay on their Facebook page for too long so it’ll be important to include a link on the main tab for a while as well. The wall post will quickly move down the list but in the short-term it will help people who come looking for the video. Some time later on the Facebook interview page the “Thanks for Watching the Live Q&A!” graphic (shown above) was changed to “Miss the Live Interview? Watch the Video on the New Newsweek.com” which links to the video on the Newsweek site. Glad to see this was addressed and hopefully they didn’t lose too many visitors during the critical early period when people were actively seeking out the interview.